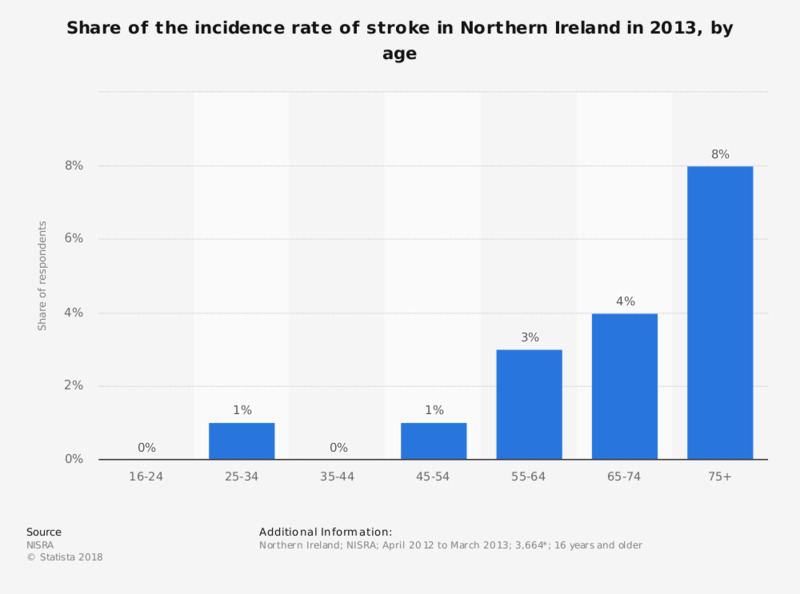 This statistic displays the proportion of individuals who have had a stroke, by age in Northern Ireland in the period from April 2012 to March 2013. In this period, eight percent of respondents aged 75 years and over have had a stroke. Have you ever felt the need to hide your Parkinson's symptoms or felt you have had to lie about having Parkinson's? When, if at all, did you tell people about your Parkinson's diagnosis? Have you ever regretted delaying telling those you know about your Parkinson's diagnosis? Which of the reasons, if any, explain why you delayed telling work colleagues? Which of the reasons, if any, explain why you delayed telling family or friends? Did you delay telling anyone about your Parkinson's diagnosis? For how long have you been diagnosed with Parkinson's?